IDT-5 240 is an in-line laser with a strong protective cover, built with precision and high quality components to guarantee an extended working life, which is covered by a 30 month guarantee. 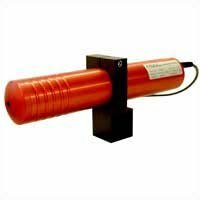 IDT-5 240 emits a fine, visible red line, from 3 metres (10 mW) to 12 metres (30 mW) in length, for accurate positioning of the material to be worked. Its internal power supply ensures protection against electrical surges. Further protection is given by the specially designed external fuse (IP67). The state-of-the-art mechanical construction of the IDT-5 240 guarantees temperature stability, without the need for cooling systems. The support can be attached to all standard fixtures with a diameter of 20 mm, so as to simplify the positioning of the IDT5240 on tools.